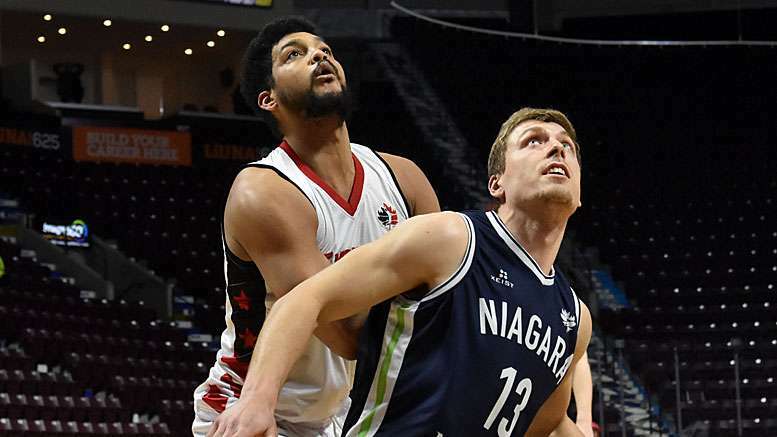 (WINDSOR, ON) – The day after letting a game get away from them to the London Lightning, The Windsor Express returned to the court to host the Niagara River Lions in NBLC action. Having already clinched a playoff spot, the Express were aiming to cover ground between them and London while push the Lions further to the rear. The Express stepped off with the very early lead, but a penchant for giving up second chances let Niagara creep into the lead. A series of missed opportunities allowed the Lions to deepen the margin to 10 with 3:00 left on the clock. A triple and a jumper for 2 by Braylon Rayson cut into the lead and at the horn, Niagara enjoyed a 32-27 advantage. Niagara led in all the important categories in addition to the score. The Lions owned 2nd chance points 9-2, points in the paint 20-12, and points off of turnovers 8-2. They also out rebounded Windsor 15-9, including 8 offensive. Both teams spread out the scoring so that Demontre Harris led Windsor with 6 and likewise Devonta Pollard with 8 for Niagara. Windsor found new wind to star the 2nd quarter. Firing on all cylinders, the Express jumped in front 37-35 before the period was 2 minutes old. Over the next 120 seconds, Niagara worked their way back in front by way of the long ball, and re-established a 3-point buffer. Windsor’s Maurice Jones took it upon himself to drive the hoop for 4 points and set up Kevin Loiselle on a fast break to take over the lead. The teams then traded the lead over the following possessions in a see-saw battle to establish a run. The Lions clung to a single point lead, 61-60, at halftime. During the game, Loiselle reached 1,000 regular season career rebounds; the first Canadian player to do so in the NBLC. Windsor improved in all categories during the 2nd quarter, giving Niagara more competition for the game. Harris continued to lead the Windsor offense with 12 points, and Rayson offered 10 off the bench, while Pollard accounted for 14 and Kris Joseph 11 for Niagara. The Express hit the court for the 3rd quarter determined to not bow to history. Dogged effort and unceasing ball movement mark the play of Windsor as they push the limits of the Niagara defense. Battling under the basket earned the Express 29 points in the period as they took a slight 93-84 lead into the 4th frame. Both teams were struggling from the floor as they shot 44.4% and 49.2% for Niagara and Windsor, respectively. The outside game was very similar with 30% and 33.3%, likewise. Windsor opened the final period with a trey and then the two clubs became content to run back and forth with nothing to show for it for 1.5 minutes. There was no slowing of the pace as Niagara added 14 points to their score and Windsor 16. With a 13-point lead, Windsor began to deliberately slow down the pace of the play. More ball movement was coupled with running down the shot clock on each possession. Even on a 2-on-1 break, Jones doubled back to waste more time, foregoing the points. By game’s end, Windsor was sitting on a 120-107 margin of victory. Harris, Strong and Rayson each picked up 21 points for the Express in the win. Windsor now has 11 days off before they host the Island Storm in the make-up game. The intervening time off will allow the roster to nurse their associated bruises, including Chad Frazier who was pulled from the lineup with a lower body injury. Strong was inserted in his spot in the starting grid.